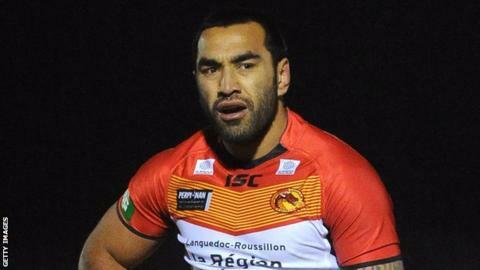 Catalan Dragons survived a late London Broncos revival to continue their recent resurgence. Tries from Zeb Taia, Michael Oldfield, William Barthau - all converted by Thomas Bosc - put Dragons 18-0 up before Mason Caton-Brown hit back. But Eloi Pelissier and Vincent Duport then scored to open a 24-point lead. Caton-Brown's second try sparked a Broncos fightback, but further scores from Nesiasi Mataitonga and Denny Solomona came too late. The French side were coasting at 28-4 with 68 minutes on the clock, only to be left clinging on at the end in front of a poor crowd of just 1,002. That pulled them six points clear of the Londoners, who occupy the final Super League relegation spot. Laurent Frayssinous's Dragons, who eased past the Broncos in the fourth round of the Challenge Cup a fortnight ago, have won four of their last five matches in all competitions. "You are never happy with a loss, but our fight to the death was impressive. "There was a lack of confidence at the start, and we made too many errors. But we are showing good progress which is obviously very important to us." "I was very worried in the last 15 minutes as London seemed as though they could score from anywhere. "It might have been a lack of concentration on our part. We knew London had to come at us and they did. A few calls went against us and we were up against it." London Broncos: Mataitonga; Duckworth, Solomona, Caton-Brown, Minns; Farrar, Drinkwater; Greenwood, Moore, Krasniqi, Vea, McMeeken, Foster. Replacements: Slyney, Cook, Cunningham, Macani. Catalan Dragons: Escare; Oldfield, Pomeroy, Duport, Pala; Bosc, Barthau; Elima, Pelissier, Lima, Taia, Whitehead, Baitieri. Replacements: Bousquet, Paea, Garcia, Guasch.